The Provincial Guidelines for Regional Epilepsy Surgery Centres is the result of a collaborative effort between CCSO, the Epilepsy Implementation Task Force (EITF), and Provincial Neurosurgery Ontario (PNO). The EITF was established in June 2013 to develop and implement a provincial framework to maximize value from the system of epilepsy care in Ontario. CCSO supports the work of the EITF, a subgroup of PNO, as part of its mandate to support equitable and timely access to neurosurgical care, including epilepsy surgery, and to help maintain the province’s neurosurgical capacity. 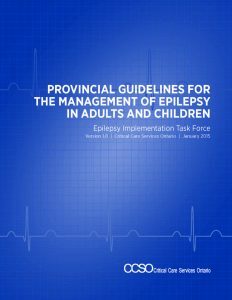 PROVINCIAL GUIDELINES FOR THE MANAGEMENT OF EPILEPSY IN ADULTS AND CHILDREN To support the flow of patients towards appropriate treatment for epilepsy, this document contains a set of guidelines to help with the diagnosis, treatment and referral practices from the moment of a patient’s first seizure. PROVINCIAL GUIDELINES FOR EPILEPSY SURGERY REFERRALS IN ONTARIO The Provincial Guidelines for Epilepsy Surgery Referrals in Ontario provides evidence-based practice guidelines to support the diagnostic and therapeutic referrals of patients with medically-refractory epilepsy. It defines indications for epilepsy surgery, with careful consideration given to the paediatric population. 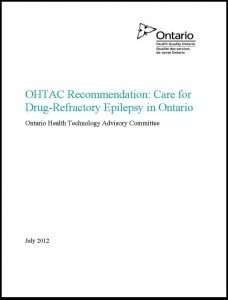 PROVINCIAL EPILEPSY MONITORING UNIT (EMU) GUIDELINES FOR ONTARIO This document outlines protocols and provides guidelines for EMUs for diagnostic evaluation for epilepsy. It can be used as a guide for neurosurgical centres with EMU beds. The protocols are based on current processes in existing EMUs and represent expectations for the highest standards of epilepsy care. PROVINCIAL GUIDELINES FOR THE MANAGEMENT OF MEDICALLY-REFRACTORY EPILEPSY IN ADULTS AND CHILDREN WHO ARE NOT CANDIDATES FOR EPILEPSY SURGERY This guideline provides an approach to the management of the patient with medically intractable epilepsy in whom surgical treatment is not an option. It includes the use of antiepileptic medications and non-antiepileptic therapy such as dietary management and neurostimulation. PROVINCIAL GUIDELINES FOR REGIONAL EPILEPSY SURGICAL CENTRES This document presents guidelines that set out accountabilities for hospitals and their collaborative interdisciplinary teams that provide care for patients at Regional Epilepsy Surgical Centres. REGIONAL EPILEPSY SURGERY CENTRES – PROGRAM MODEL AND TECHNICAL GUIDE This document presents best practices as a recommended, but not mandatory, clinical protocols and program model for hospitals and their collaborative interdisciplinary teams that provide care for patients at Regional Epilepsy Surgical Centres. 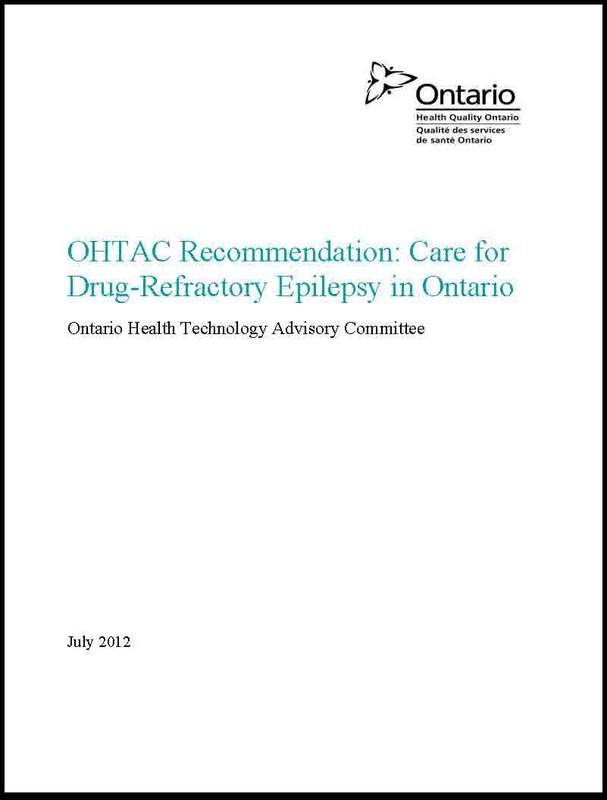 An OHTAC Expert Panel on a Provincial Strategy for Epilepsy Care that was asked to provide a report on the current state of care for drug-refractory epilepsy in Ontario and major issues concerning epilepsy care in Ontario, and form recommendations for a provincial strategy for epilepsy care in Ontario. 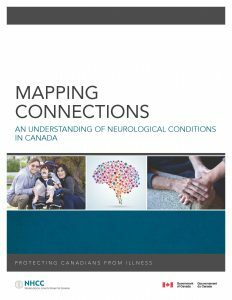 Neurological Health Charities Canada, The Public Health Agency of Canada, Health Canada, The Canadian Institutes of Health Research, 2014 Neurological conditions (diseases, disorders, and injuries) can directly affect Canadians of all ages. Such conditions can be severe or mild, progressive or non-progressive, or uncontrolled or controlled. As these conditions may lead to symptoms and functional deficits that are often chronic in nature, they can have profound impacts on the life and well-being of affected individuals, their families, caregivers, and communities. 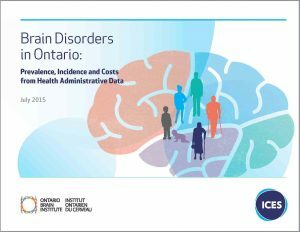 ATIVE DATA Institute for Clinical Evaluative Sciences, Ontario Brain Institute, 2015 The estimated prevalence, incidence and costs associated with health system use for each of 13 brain disorders as well as the demographic, prevalence, incidence and cost patterns observed across the brain disorders.